Economics is a science as well as art. But which type of science is a big question here, i.e. positive or normative? Positive economics is related to the analysis which is limited to cause and effect relationship. On the other hand, normative economics aims at examining real economic events from the moral and ethical point of view. It is used to judge whether the economic events are desirable or not. While Positive economics is based on facts about the economy. Normative economics is value judgment based. Most of the people think that the statements which are commonly accepted are a fact but in reality, they are valued. 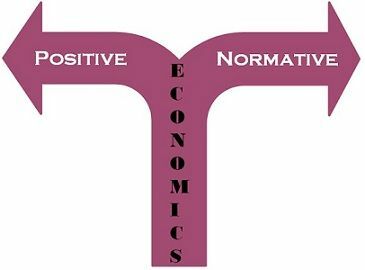 By, understanding the difference between positive and normative economics, you will learn about how the economy operates and to which extent the policy makers are taking correct decisions. Meaning A branch of economics based on data and facts is positive economics. A branch of economics based on values, opinions and judgement is normative economics. What it does? Analyses cause and effect relationship. Passes value judgement. Testing Statements can be tested using scientific methods. Statements cannot be tested. Economic issues It clearly describes economic issue. It provides solution for the economic issue, based on value. Positive Economics is a branch of economics that has an objective approach, based on facts. It analyses and explains the casual relationship between variables. It explains people about how the economy of the country operates. Positive economics is alternatively known as pure economics or descriptive economics. When the scientific methods are applied to economic phenomena and scarcity related issues, it is positive economics. Statements based on positive economics considers what’s actually occurring in the economy. It helps the policy makers to decide whether the proposed action, will be able to fulfill our objectives or not. In this way, they accept or reject the statements. The economics that uses value judgments, opinions, beliefs is called normative economics. This branch of economics considers values and results in statements that state, ‘what should be the things’. It incorporates subjective analyses and focuses on theoretical situations. Normative Economics suggests how the economy ought to operate. It is also known as policy economics, as it takes into account individual opinions and preferences. Hence, the statements can neither be proven right nor wrong. Positive Economics refers to a science which is based on data and facts. Normative economics is described as a science based on opinions, values, and judgment. Positive economics is descriptive, but normative economics is prescriptive. Positive economics explains cause and effect relationship between variables. On the other hand, normative economics pass value judgments. The perspective of positive economics is objective while normative economics have a subjective perspective. Positive economics explains ‘what is’ whereas normative economics explains ‘what should be’. The statements of positive economics can be scientifically tested, proved or disproved, which cannot be done with statements of normative economics. Positive economics clearly define economic issues. Unlike normative economics, in which the remedies are provided for the economic issues, on the basis of value judgment. After the above discussion, we can say that these two branches are not contradictory but complementary to each other, and they should go hand in hand. While laying down laws and theories, economics should be treated as a positive science, but at the time of practical application, economics should be treated as a normative science. Nice writing there. Would you please add welfare economics in the comparison chart we don’t have to search elsewhere for it.